Headline economic indicators suggest the world is finally getting back on track after the global crisis that erupted 10 years ago. A broad-based pickup in GDP growth rates is under way, stock markets have never been higher and the world’s major central banks are cautiously preparing to unwind the exceptional policies of the post-crisis period. However, this relatively upbeat picture masks numerous concerns. This has been the weakest post-recession recovery on record. Productivity growth remains puzzlingly weak. 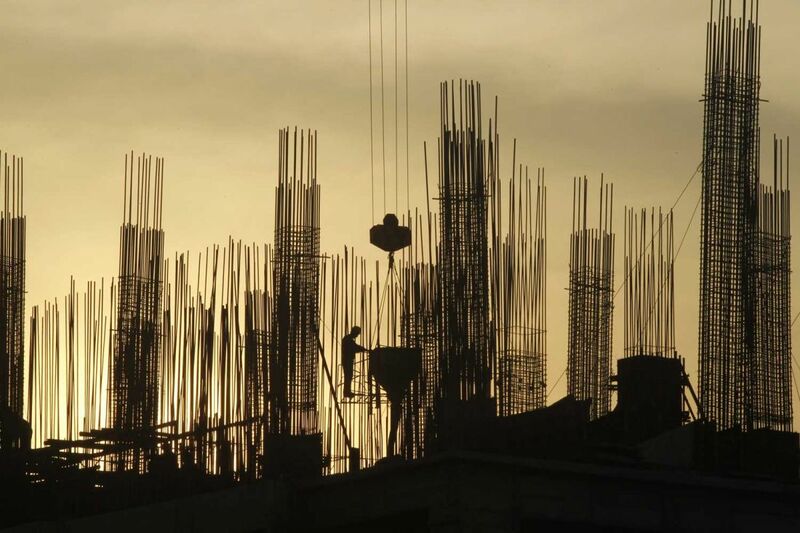 Investment growth has been subdued, and in developing economies it has slowed sharply since 2010.1 And in many countries the social and political fabric has been badly frayed by many years of stagnating real incomes. The reassuring headline indicators mean that economic and financial risks are becoming a blind spot: business leaders and policy-makers are less prepared than they might be for serious economic or financial turmoil. The risks can be divided into two categories: (1) familiar vulnerabilities that have grown, mutated or relocated over time; and (2) newer fragilities that have emerged in recent years. The world is eight years into a bull run, with global stock markets hitting all-time high after all-time high. This has raised fears that this is another episode of “irrational exuberance”, that the lessons of the crisis have gone unlearned,2 and that a deep correction may follow. In 2017, the Dow Jones increased by 25%, the S&P500 by 19%, the Hang Seng in Hong Kong SAR by 35%, the Nikkei in Japan by 19%, the DAX in Germany by 11% and the CAC40 in France by 8%. 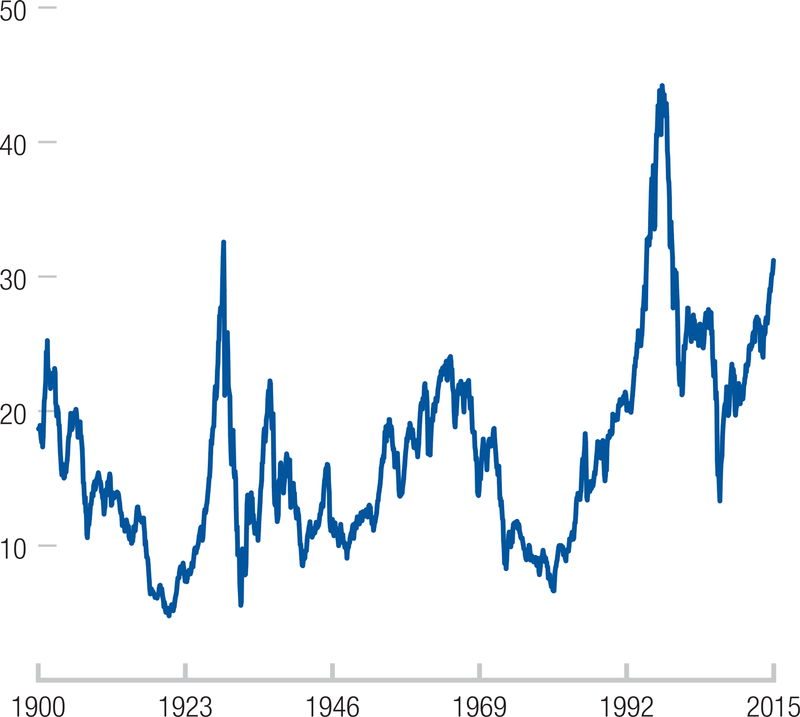 According to one commonly used measure of cyclically adjusted prices (see Figure 2.1), US stocks have only twice in history been higher than they are at the moment: just prior to the crashes of 1929 and 2000. If there were to be a sharp market correction, the impact on the real economy would arguably be greatest in countries most heavily exposed to sectors and markets in which bubbles have formed—for example, a country economically reliant on exports of a commodity that plunges in value. The impact of confidence and wealth effects means that real-economy impacts would also be felt strongly in countries—notably the United States and the United Kingdom—in which the ownership of financial assets is most widespread. It is not just stocks and bonds that have seen their prices rise. 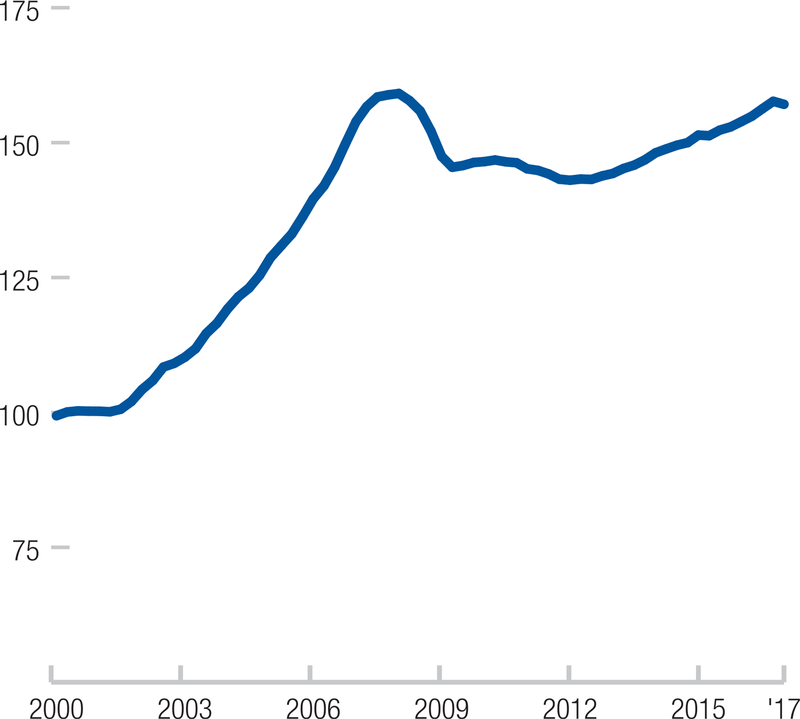 The International Monetary Fund (IMF)’s index of global house prices is close to its pre-crisis peak again (see Figure 2.2), and signs of stretched valuations are evident in numerous cities including Hong Kong, London, Stockholm, and Toronto. Inflation in all these traditional asset classes has been dwarfed by more speculative assets such as the cryptocurrency Bitcoin, which increased in value by around 1200% in 2017. Source: International Monetary Fund (IMF). A further source of potential market risk at present is that innovations in financial assets and asset management have yet to be tested in crisis conditions. One example is the rapidly expanding class of exchange-traded funds (ETFs), which have grown in value by 500% since 2008 and now account for US$4 trillion of assets and around 25% of all US stock market trading.4 Some analysts suggest that ETFs would cushion the blow of a major market correction, while others reckon they would exacerbate it. Prior to the 2008 crisis, the world was awash with cheap loans. Remarkably, there has been no aggregate deleveraging since. In fact, the total global debt-to-GDP ratio is significantly higher now than it was before the crisis. 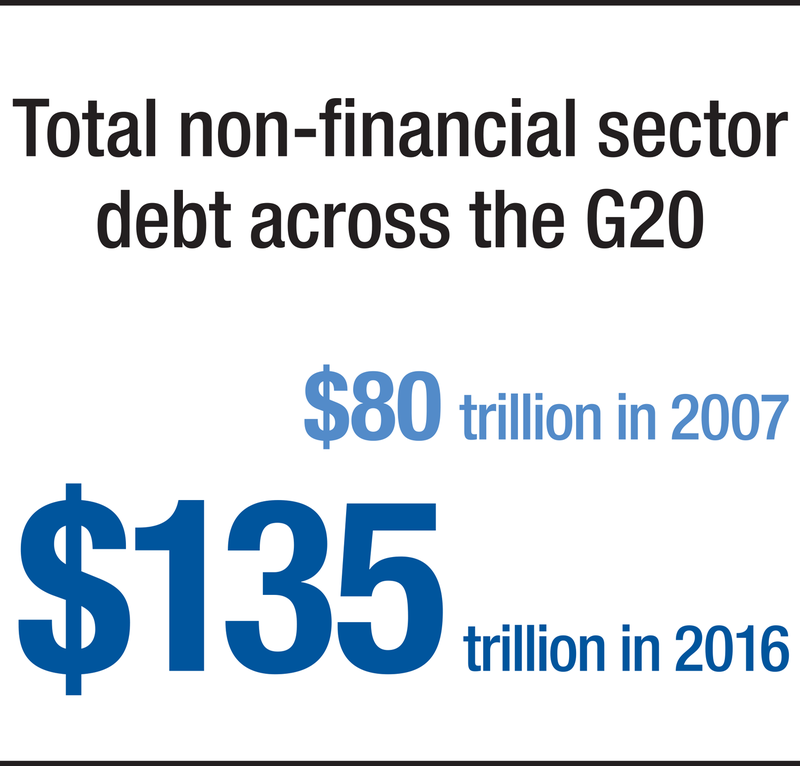 In its latest Global Financial Stability Report, the IMF highlighted the potential risks posed by the build-up of non-financial sector debt in the G20 (i.e. the debt held by households, governments and non-financial companies). In 2016, this debt totalled US$135 trillion, up from US$80 trillion in 2007.6 Indebtedness has risen differently in advanced and emerging economies. Advanced economies built up huge debts before the crisis erupted, but their overall level of debt has remained relatively constant in the subsequent decade: as a proportion of GDP, modest deleveraging by households and financial institutions has been offset by increases in government debt resulting from stimulus spending. Meanwhile, signs of strain are evident in parts of the corporate debt market. According to S&P Global, 162 corporate defaults worldwide occurred in 2016, the most since 2009 and up from 113 in 2015.7 The debt-to-equity ratio of the median S&P 1500 company (excluding financials) has almost doubled since 2010 and is now well above its pre-crisis level. China’s banking sector has ballooned to hold assets valued at US$33 trillion, or 3.1 times the country’s annual output. 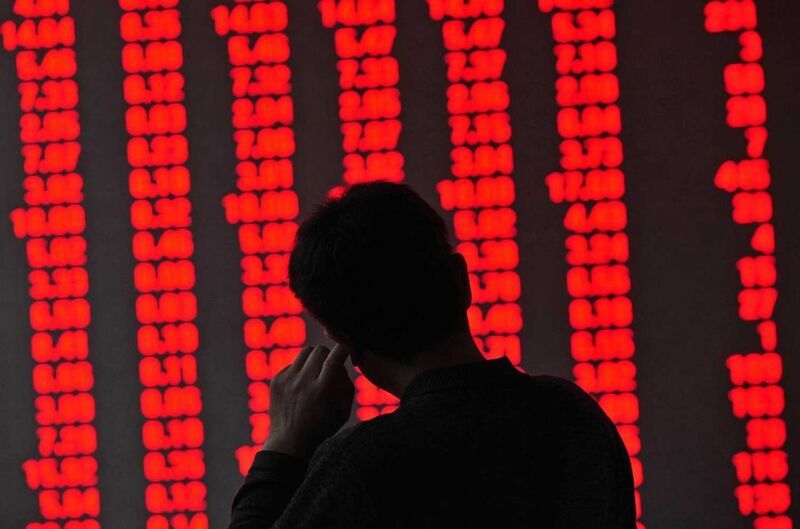 Arguably, these figures understate the full extent of the country’s potential fragilities, because they do not capture the rapid growth of the more lightly regulated shadow banking sector.9 The regulatory separation of the financial sector in China from that of the rest of the world reduces the risk of systemically significant financial spillovers, but as early as 2015 the governors of the European Central Bank were cautioning that “financial developments in China could have a larger than expected adverse impact.”10 Given how deeply embedded China now is in the world economy, if the country’s authorities were to step in decisively to secure the stability of the financial system, the resulting slowdown in domestic growth could represent a damaging blow to global demand. China can deploy vast resources to protect its economy, but most emerging economies are much more directly exposed to any worsening of global conditions. If the major central banks’ interest rates were to move significantly higher, lower-income emerging market economies would take a direct hit from the combination of higher rates and worse exchange rates, increasing the cost of borrowing US dollars or other hard foreign currency. Already there are signs that debt-servicing costs for many of these countries are rising gradually from the record lows of a few years ago. These problems are most pronounced in countries with high levels of foreign-currency debt, particularly oil-exporting countries where sustained low oil prices have hit companies’ revenues and governments’ fiscal positions. In October 2017, for example, the governor of the Central Bank of Kenya cautioned that government debt in a number of African countries has reached levels at which an external shock “could push us over”.11 Countries facing significant strain include Angola, Gabon, Ghana, Mozambique and Zambia. The third long-standing risk is the health of the financial system, even though much has been done to restore the banking system to stability after its near-collapse in 2008. Regulators have overseen an increase in the core capital ratios of 30 globally systemic banks, from 10.3% at the end of 2011 to 12.6% at the end of 2016.12 Widespread changes in the structure of the sector include collapses, mergers, and a politically sensitive supranational “banking union” in the Eurozone.13 Restrictions—such as the Volcker Rule, which since 2015 has prohibited banks in the United States from making market bets with their own capital—have been put on the risks that banks are allowed to take.14 And there has been a winding down of the sector’s reliance on wholesale inter-bank lending, a potentially volatile source of funding that evaporated in 2008 as banks began to lose trust in each other’s creditworthiness. 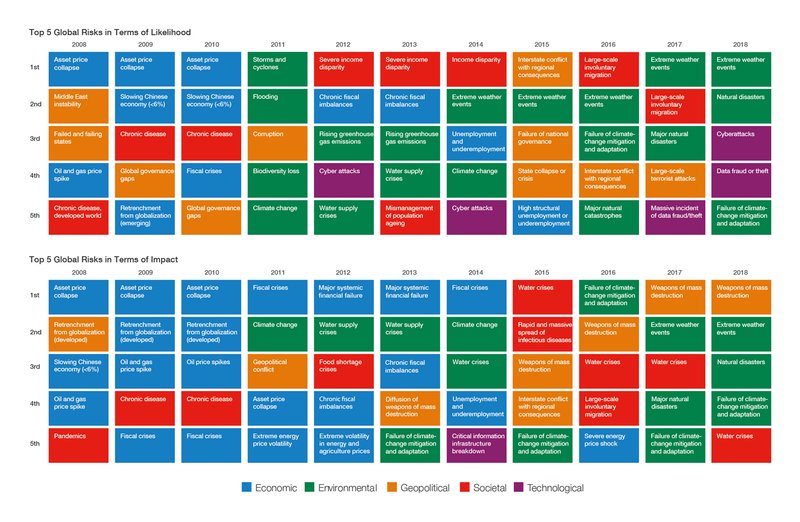 The familiar vulnerabilities outlined above are now compounded by a range of newer fragilities that have emerged or strengthened materially since the crisis. How much room for manoeuvre policy-makers retain is open to question. Put simply, is there enough fiscal and monetary policy firepower left to deal with another crisis? In theory, the major Western economies that were at the centre of the global crisis could respond with another wave of major policy interventions reflecting the synergies that are currently at play between monetary and fiscal policies, with central bank asset purchases helping to alleviate governments’ fiscal pressures by keeping down debt-servicing costs.18 However, this scenario places a lot of faith in the effectiveness of unconventional monetary policies such as asset purchases, particularly when deployed as the primary line of defence rather than alongside a sharp interest-rate stimulus. Facing a recession—let alone a crisis—with very limited scope to cut interest rates would be unprecedented. The Fed has responded to past US recessions by cutting its benchmark policy rate by an average of 5.5 percentage points. That benchmark rate currently stands at just 1.25%, and market expectations are that it will plateau at around 3%. In other words, even if the Fed were to cut rates to zero in response to a new recession, there would still be at least a 2.5 percentage point shortfall relative to the usual scale of response.19 Assuming they wanted to deliver a similar level of stimulus, the European Central Bank, the Bank of Japan and the Bank of England would all face even greater shortfalls given that their interest rates are currently even lower than the Fed’s. Central banks were crucial to restoring economic confidence among households, businesses and markets after the crisis. Repeating that feat could be a struggle without interest rates at their disposal. And without a floor placed under confidence, the risk of the next downturn being much deeper and longer than might otherwise be the case would increase. A second emergent source of economic risk is the rapid technological change that has taken place even in the decade since the global crisis. The history of previous waves of innovation suggests that the nascent Fourth Industrial Revolution will ultimately deliver broad-based economic benefits. However, technological pessimists query whether current innovation has little of the transformative power analogous to that of previous discoveries and inventions, such as electricity, household appliances and the combustion engine.20 Even optimists caution that major disruption may be inevitable as societies adapt: the original Industrial Revolution delivered huge increases in human welfare, but it also caused prolonged social and economic turmoil and set the scene for new revolutionary modes of politics.21 Worries about the economic impact of new technologies were prominent in this year’s Global Risks Perception Survey (GRPS)—the most frequently cited risk interconnection was the pairing between unemployment and adverse impacts of technological advance. Last year’s Global Risks Report discussed the spillover of economic risks into various recent episodes of political disruption across the world.27 The directionality can run both ways, as discussed in the chapter on Geopolitical Power Shifts: populist and identity politics can amplify risks of economic and financial disorder by upending previously stable economic principles and practices, particularly those relating to trade. The two countries that experienced the most disruptive political results in 2016—the United Kingdom and the United States—have both entered a period of uncertainty and volatility in their external economic relations. The United Kingdom is in the process of leaving the European Union, while the United States has withdrawn from the Trans-Pacific Partnership (TPP) and is seeking a renegotiation of the North American Free Trade Agreement (NAFTA). Mercantilist and protectionist pressures have been building in many countries for years: according to Global Trade Alert, protectionist interventions have increased markedly since 2012. 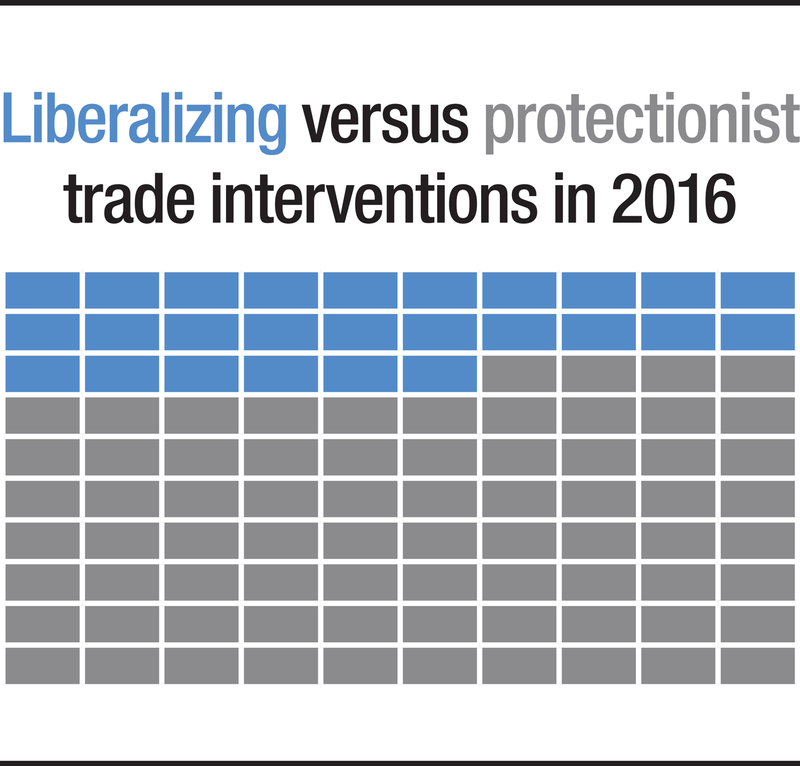 A new high was recorded 2016, when 571 of the 771 trade interventions tracked by Global Trade Alert were characterized as discriminatory and just 200 as liberalizing. Early data for 2017 point to a continuation of this trend, particularly in the United States, where the first six months of the year saw a 26% jump in trade actions against G20 partners.28 The risk of economic damage is not restricted to trade protectionism—mercantilism and unilateralism could trigger a wider deterioration of global interconnectedness, including reduced investment flows, increased obstacles to cross-border business and constraints on labour mobility. The backdrop of pronounced geopolitical uncertainty and increasingly transactional approaches to interstate relations increases the risk that economic disputes will flare up. We can distinguish between (1) disputes stemming from tensions between countries’ economic agendas and policies, and (2) geopolitical tensions—up to and including military conflict—that cause disruption to economies and markets. The results of the GRPS are pessimistic in this regard: the overwhelming majority of respondents expect the risks of interstate military conflict or incursion to increase in 2018. New technologies add a layer of economic vulnerability to geopolitical disruptions, with emerging risks of asymmetric economic warfare including potential cyberattacks designed to disrupt critical financial infrastructure. It is striking how sanguine financial markets have remained while political and geopolitical risk has jumped in recent years. Given current market dynamics, it may not be rational for any single market participant to price in rising political and geopolitical tensions. The risk is that we will hit a tipping point at which point everyone prices in these tensions, with a rush to the exits that hits asset prices, strains the resilience of the global financial system and tests whether policy-makers retain the firepower to prevent deep and long-lasting impacts on the real economy. 8 International Monetary Fund (IMF). 2017. People’s Republic of China: Selected Issues. IMF Staff Country Report No. 17/248. August 2017. Washington, DC: IMF. http://www.imf.org/en/Publications/CR/Issues/2017/08/15/People-s-Republic-of-China-Selected-Issues-45171, p. 17. 12 Bank for International Settlements (BIS). 2017. Basel Monitoring Report: September 2017. https://www.bis.org/bcbs/publ/d416.pdf, p. 72. 15 See, for example, King, M. 2016. The End of Alchemy: Money, Banking and the Future of the Global Economy. New York: Norton. 16 See World Economic Forum. 2017. The Global Competitiveness Report 2017–2018. Geneva: World Economic Forum. http://reports.weforum.org/global-competitiveness-index-2017-2018/, p.14. 17 See Cetorelli, N. and L. S. Goldberg. 2011. “Global Banks and International Shock Transmission: Evidence from the Crisis”. IMF Economic Review 59 (1): 41–76. https://papers.ssrn.com/sol3/papers.cfm?abstract_id=1801096; and Christensen, B. V. 2016. “Challenges of Low Commodity Prices for Africa”. BIS Papers No. 87. http://www.bis.org/publ/bppdf/bispap87.htm. 20 Gordon, R. J. 2016. The Rise and Fall of American Growth: The U.S. Standard of Living since the Civil War. Princeton, NJ: Princeton University Press. 24 Hallward-Driemeier and Nayyar. 2017. Op cit., p. 60.